The release of the iMac Pro is significant for Apple. The Mac Pro, released in 2013, has had only one minor update in four years, and Apple earlier this year admitted that the machine is a mistake. And while the company could say that a top-of-the-line iMac has plenty of processing power, it’s not the workstation-level computer that demanding professionals want. This machine is a sign that Apple still values pro users and wants to offer a Mac that can meet their demands. During an iMac Pro media event (attended by Macworld), company executives and third-party developers in attendance hammered that point home. iMac Pro pricing starts at $4,999 for the 8-core baseline configuration. The 10-, 14- and 18-core processors are offered as configure-to-order options, along with RAM (32GB, 64GB, or 128GB), flash storage (1TB, 2TB, or 4TB), and graphics. 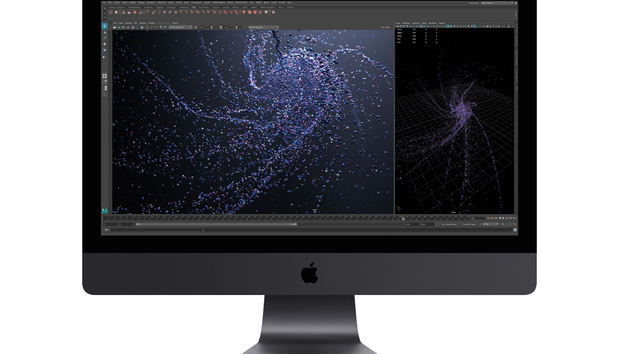 At the heart of the iMac Pro is an Intel Xeon processor. Specifically, the Xeon W, a workstation-class CPU targeted at workstation-class software that uses multiple processing cores. The processors incorporate Advanced Vector Extensions 512 (AVX 512), Intel’s instruction set for 512-bit SIMD (single-instruction, multiple-data) operations. Apple offers four different processor configurations: 8-core, 10-core, 14-core, and 18-core. Apple considers the 10-core model the one that will appeal to most users, hitting a sweet spot between price and performance; it also offers the highest Turbo Boost frequency of the four models at 4.5GHz. The 14-core iMac Pro was not previously announced as part of the lineup. Pushing the pixels to the iMac Pro’s display are AMD Radeon Pro Vega graphics. Base configurations come with 8GB Radeon Pro Vega 56 graphics, with an option to upgrade to the 16GB Radeon Pro Vega 64. Apple reiterated throughout the event that these processors and GPUs were the fastest ever used in a Mac. In software demos of Adobe Dimension CC, Osirix, TwinMotion, Maxon Cinema 4D, high-resolution 3D images rendered on the fly in real time, with barely any noticeable jitter or lag. In VR demos with Gravity Sketch and Servios’ new Electronauts, 3D objects and animation flowed smoothly. Most impressive was a demo of Apple’s Xcode, which ran several UI tests and VMware Fusion virtual machines at the same time without the iMac Pro breaking a sweat. Just as the iMac Pro’s processor and graphics are the best ever in a Mac, so too is the the display, according to Apple. The specifications of the display certainly are impressive. Sporting a 5120‑by‑2880 resolution and 500 nits of brightness, the 27-inch Retina display is capable of displaying billions of colors and uses the P3 color gamut. It is not, however, an HDR display. At the event, it wasn’t possible to spend any time really examining the display’s picture quality and performance, and the specs match up with the current 27-inch 5K iMac. Apple’s iMac displays have always been of top quality, and chances are this display will follow suit. 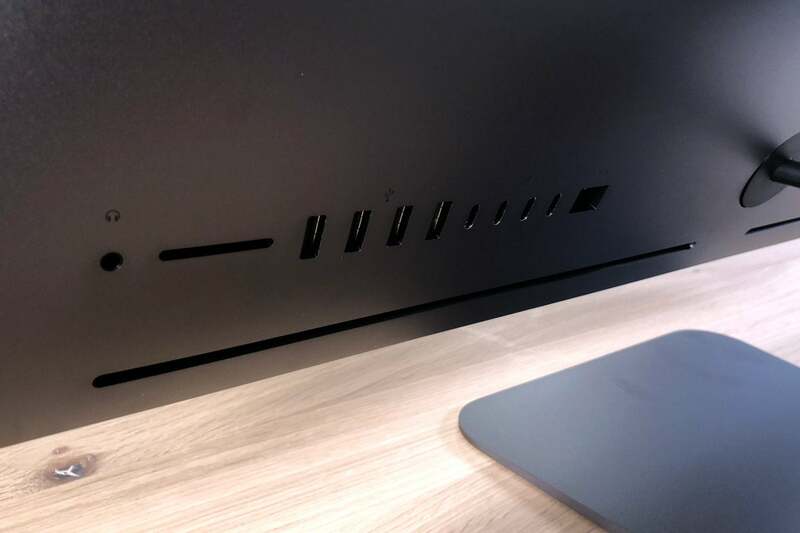 iMac Pro ports (left to right): headphone, SD card, 4 USB 3 ports, 4 Thunderbolt 3 connectors, 10Gb ethernet. As for the external design, Apple made a conscious decision to maintain the look of the iMac that we all know; it even has similar dimensions to the iMac. One main difference is that the iMac Pro allows for user–configurable VESA mounting—the consumer iMac must be configured with a VESA mount at the time of purchase. Other differences include the obvious space gray finish (which is quite impressive in person) and rear air vents. Speaking of the air vents, that brings us to the internal design of the iMac Pro. Though you’ll probably never see the insides, Apple made a great effort to address the cooling needs of this Mac. The iMac Pro doesn’t use a hard drive or a separate solid-state-drive mechanism; all of the flash storage is on the motherboard. This allowed Apple to install a massive heat sink and dual blowers, which Apple says results in 80 percent better cooling than the iMac’s design. In the software demos I mentioned previously, not once did I notice any fan noise. Not a whirl or the white noise of air blasting through the vents. During the Xcode demo we were encouraged to feel the back of the iMac Pro for a heat check, and it was warm to the touch, but I think I’ve felt more heat from my MacBook Pro. A design decision that some users won’t agree with is the inability for users to access the iMac Pro’s RAM. Fortunately, the RAM is installed in DIMM slots, not soldered on to the motherboard, so if you have the ability to open up the iMac Pro, you can upgrade the RAM. You don’t have to order more RAM than you need at the onset, but if you want to upgrade later, Apple considers this task one that needs to be done by a service provider. In the MacBook Pro with Touch Bar, Apple introduced the T1 chip, which handles processing and display for the Touch Bar and provides the secure enclave for Touch ID. With the iMac Pro, Apple debuts the T2, which controls components and tasks that were once covered by other discrete chips, such as the FaceTime camera, LEDs, and storage devices. The T2 essentially frees the main CPU from these menial tasks so it can focus on serious processing. The T2 chip also provides a new set of security features. The T2 provides a secure enclave for file encryption (FileVault) and a new startup security feature, which, unfortunately, wasn’t demonstrated at the event. Apple says that the iMac Pro will include a software utility for configuring the secure boot process. Apple doesn’t usually comment on future products, so the company won’t say if the T2 will be used in other Macs. But if you’ve been following the business side of Apple, you’ve probably heard about Apple’s dealings with third-party chip fabricators and the company’s desire to make their own silicon. It’s a foregone conclusion that we’ll see the T2 or a later generation of the chip in other Macs, it’s just a matter of when. 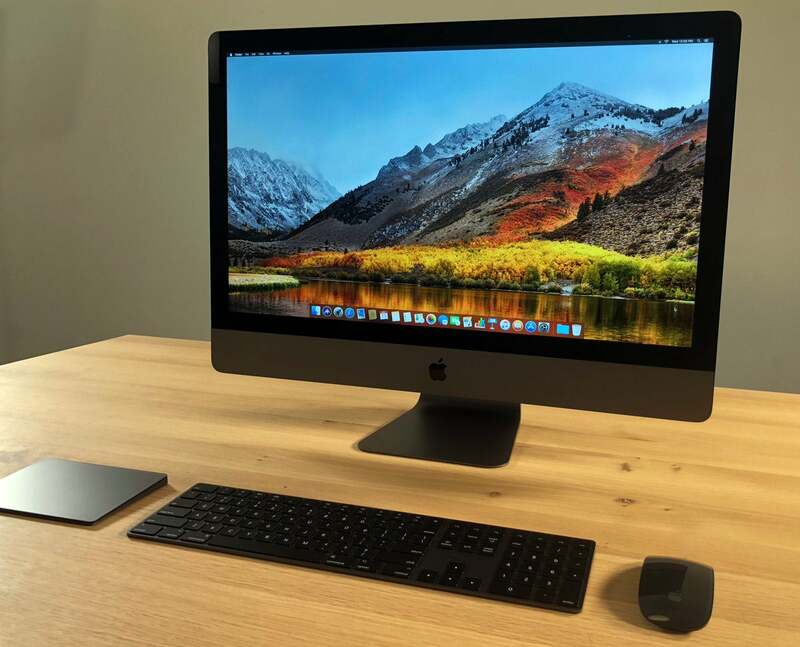 A space gray iMac Pro wouldn’t be complete without space gray accessories, and Apple includes a Magic Mouse 2 and a Magic Keyboard with Numeric Keypad that properly match the iMac Pro. For $50 more, you can get a space gray Magic Trackpad 2 instead of a mouse, or you can pay an additional $129 to get both. 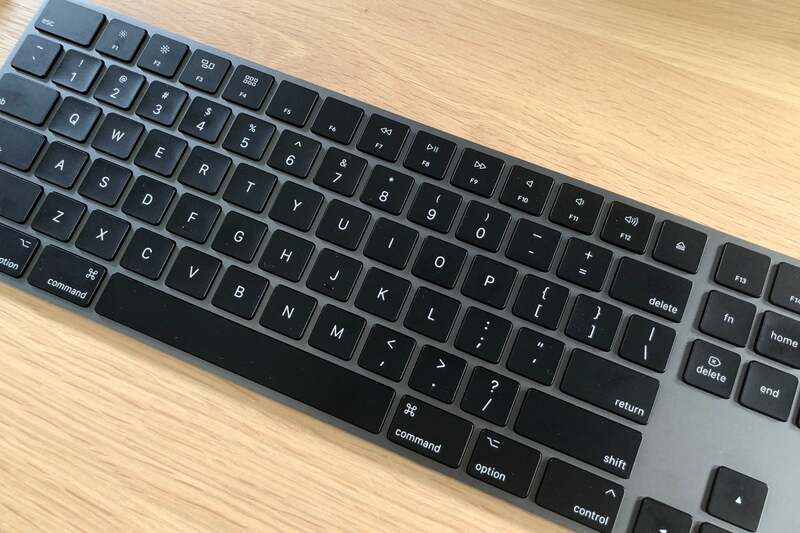 Color aside, these devices as the same as offered with Apple’s iMacs, so if you hate the flat feel of the keyboard keys, you’ll hate the feel of the space gray keyboard. And I’m not a fan of the Magic Mouse 2, but man, the space gray mouse is gorgeous. Apple wouldn’t say if these devices will be available for sale separately, but there’s always a possibility if the demand is great enough. Want the space gray keyboard, mouse, and trackpad without buying an iMac Pro? No doubt you'll see them on eBay by iMac Pro owners who have other preferred input devices. iMac Pro: Should you buy one? The iMac Pro itself is a beast, both in power and price tag, capable of handling the most difficult processing tasks you can throw at it. If you aren’t sure whether an iMac Pro is the Mac for you, take a look at the reasons why you should or should not buy an iMac Pro. Macworld will do a full review of the iMac Pro once we've had time to really put it through its paces.